I know about this time period—and the beauty products produced in it—because vintage cosmetics are a passion of mine. I bought my first vintage face powder compact at a flea market over 20 years ago. It was a souvenir of the 1939 New York World’s Fair and it made me curious about other vintage vanity items. Soon I shifted my focus to collecting cosmetics ephemera, primarily from the 1880s through the 1950s. The beauty and variety of the art that adorns the face powder boxes, hair pin cards, and hair net packages is dazzling, and what is even more amazing to me is that these glorious miniature pieces of art were meant to be thrown away—and weren’t. The fact that they were kept speaks volumes about women and what they cherish. From that initial compact my collection has grown to over 1000 pieces, and I believe that each item has a story to tell. All I have to do is listen. Whenever I hold the Sta-Rite hair pin card I imagine that I’m a sales clerk at the Bullock’s department store on Wilshire during the early-1930s, about the time that the Sta-Rite pins were manufactured. The clientele at the store is upscale and demanding, so after a full day of waiting on them my feet ache and my spirits are low. I have a quarter in my handbag, so I go to the local five and dime and leave with a card of Sta-Rite hair pins and a movie magazine. The Great Depression weighs heavy on everyone, and with so much day-to-day uncertainty I take pleasure in small things. After buying the hair pins and magazine I go home to my tiny apartment, slip into my nightgown (the one that makes me look like Jean Harlow in Red-Headed Woman), and experiment with a new hairstyle. 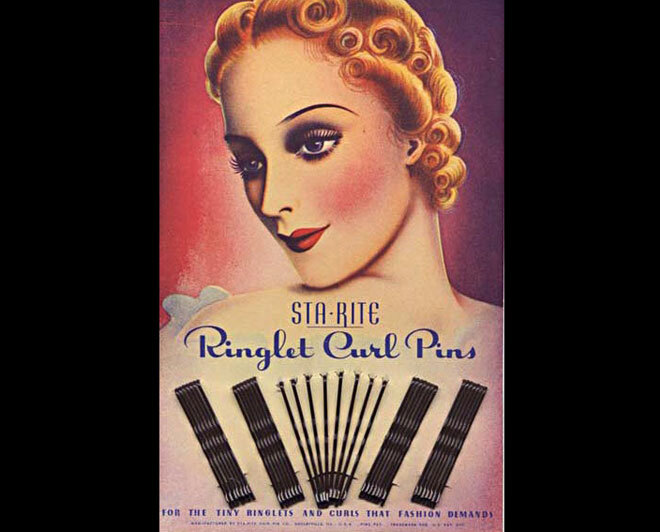 I twirl a few wicked little ringlets and pin curls around my finger and pin them in place. They are just enough to frame my face and peek out from beneath my favorite hat. I feel like a Hollywood star. The Sta-Rite company was founded in 1917 and is still in business today but, sadly, the exquisite designs that once graced their products are long gone, replaced by utilitarian packaging. What I wouldn’t give to walk into my local drug store and find shelves of face powder boxes and hair pin cards with colorful and sophisticated designs, compelling me to spend a dime of my hard earned money on a dream.